These cards are delivered entirely within an email message. Still not sure what type of eCard to send? Email sample eCard(s) to see what your recipients will receive. You will receive example card(s) shortly. Your email address will not be kept on file or used for any other purposes. The cards will have watermarks placed on them for security purposes, but will not be part of the final card you choose to send. 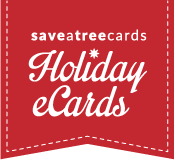 Thank you for checking out Holiday eCards powered by SaveATreeCards.